I made this at the early hour of dawn this morning, as a tribute to my very first mentor in drawing. 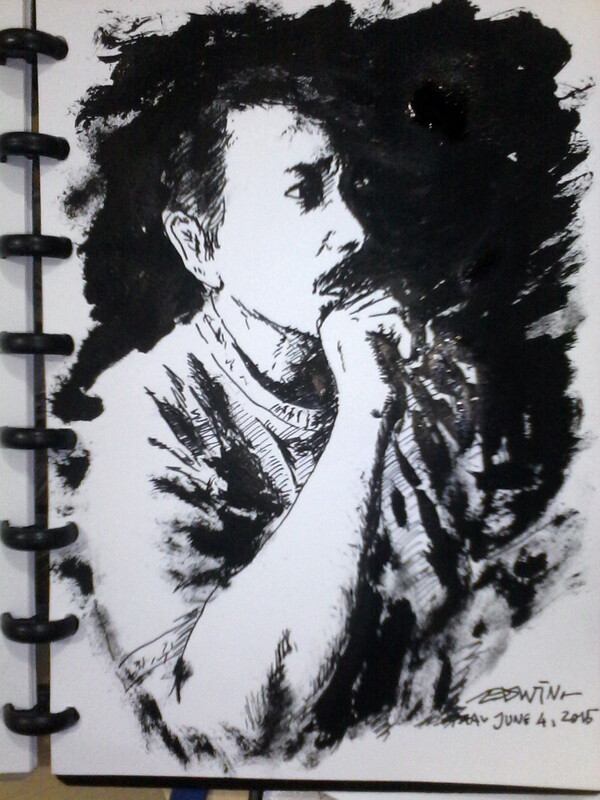 Teguh Santosa (1942-2000) was one of the best Indonesian comic artists in his era. I drew it using my Lamy Safari fountain pen (the best fountain pen I’ve ever used so far), combined with a cheap brush and Yamura ink. As you can see, it’s virtually unfinished, and I have no intention to finish it. Too much sadness in that drawing; his sadness of being forgotten by the younger generation. That’s why I don’t think I’ll be able to finish it. ~ by edwinlives4ever on June 4, 2015. Sometimes it’s better to stop before a line… than to overstep it. Yes. That’s what I was trying to say. Truly a fine tribute. It IS finished as far as I’m concerned. Thank you. I tried to emulate his drawing style for this one, but of course his is more mature. Mentoring is a gift that matures as you do. I am just beginning to understand what my mentor saw in me. Teguh Santosa was unfamiliar for me, until I found his graphic novel compilation, ” The Pandawa” story, that’s cool, super cool with those quality. I’ve heard that Teguh became animator for Marvel too? Most of his character has an indo-european anatomy appearance, or aryan face, that’s my personal opinion though. The Pandawa Story, in English? Read the Translator’s Preface. Have you read the Translator’s Preface? Not, animator. Ink man, for Conan series. Most, but not all. I never asked him why, though. I would say it is “finished” because it is at its reflective perfection of your emotions towards your mentor. Absolutely stunning piece, truly. Your respect, admiration and significant connection with this man shines through brilliantly!